Keeping pace with the technology, practitioners and vendors in the container space is immensely difficult. 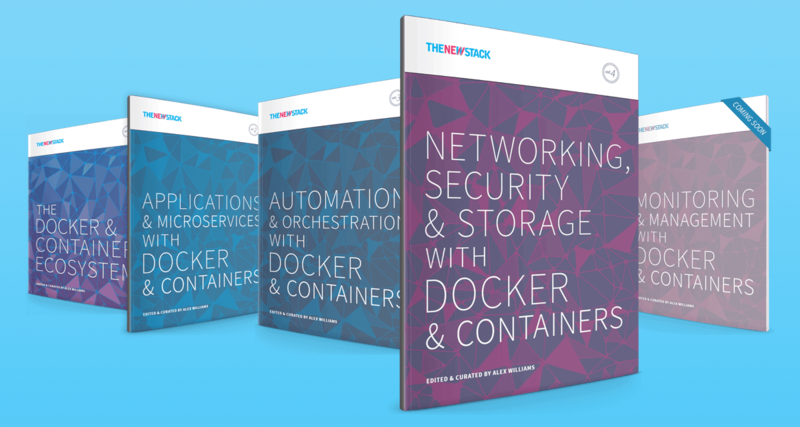 It is the largest challenge in publishing our container ecosystem ebook series. Every time we narrow our area of focus, we’ve been opened up to yet another microcosm of experienced users, competing products and collaborative projects. Our solutions directory for the container ecosystem series has expanded with each book, and currently we have catalogued over 450 active products and projects. Calling this container technology space an ecosystem has become more and more accurate as adoption flourishes and the community makes greater strides. Container technology has the ability to add so much speed to the development and deployment process, but deciding what option to choose from makes it difficult for potential adopters to get started. Comparatively, there are relative veterans who have long been composing applications with containers, have dealt with the software delivery pipeline, and automated much of the orchestration around containers. These practitioners are thinking more about how to securely network containers, maintain persistent storage, and scale to full production environments. With this ebook series, we look to educate both newcomers and familiars by going beyond operational knowledge and into analysis of the tools and practices driving the market. Networking is a necessary part of distributed applications, and networking in the data center has only become more complex. In introducing container networking, we take a closer look at the demands that are driving this change in complexity, the evolution of types of container networks, the two primary container networking specifications, the role of software-defined networking, network configuration and service discovery, and networking with OpenStack. It was also important for us to include a solid perspective on the best practices and strategies around container security. Container security has been an extremely compelling factor in this ebook series, and it’s often been cited as a barrier to entry for containers. This ebook explains how containers can facilitate a more secure environment by addressing practices around security workflows. The components of this workflow include topics such as image provenance, security scanning, isolation and least privilege, auditing and more. The book also explores how data storage fits into the dynamic and portable container lifecycle. We cover how to account for the temporary and portable nature of containers with strategies such as union filesystem architectures, host-based persistence, multi-host storage, volume plugins and software-defined storage. We discuss use cases for each of these storage strategies with the intent to show some of the patterns that have worked for others implementing container storage. There are more ways than one to skin a cat, and while we try to educate on the problems, strategies and products, much of this will be quickly outgrown. In two years’ time, many of the approaches to networking, security and storage that we discuss in the ebook will not be as relevant. But the concepts behind these topics will remain part of the conversation. Containers will still need to communicate with each other securely, container storage and security will need policy management, third-party storage and databases will need to be integrated so that stateful apps can run effectively, and so on. While creating this ebook series we identified many additional topics worthy of their own book. So be on the lookout for more publications from us. In the meantime, please reach out to our team any time with feedback, thoughts, and ideas for the future. Thanks so much for your interest in our ebook series.